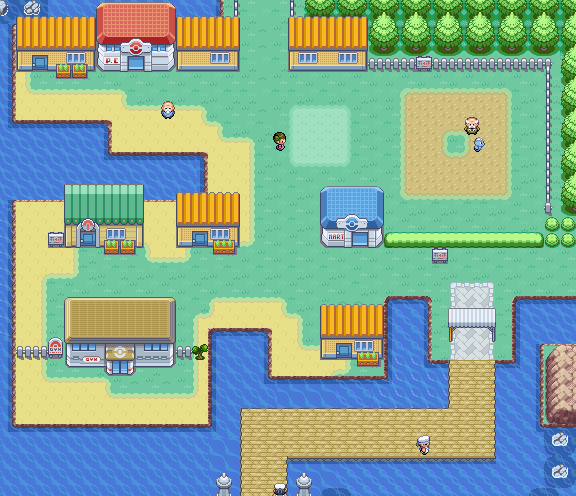 Vermilion City is a bustling coastal city full of things to see and do. Moored on the dock a large Luxury Liner, the S.S. Anne. On board you'll receive the HM for Cut, which will grant you access to previously inaccessible areas. Once you have Cut you'll be able to enter the city gym, where you'll fight a variety of trainers with Electric Pokemon. Out of the right exit is Diglett's Cave, which will take you back to Route 2 where you can pick up HM05 - Flash, which you'll need to have before you enter the Rock Tunnel. You will fight Lt. Surge in this gym. You must have HM01 Cut in order to get in the gym. Furthermore, Lt. Surge is standing behind an electric field, and you must activate two electric switches (they look like trashcans) to open the field. Stand next to a switch and press A to activate it. The second switch is always next to the first switch. Finding the right combination is trial and error. In this gym, trainers and the leader use Electric-type Pokémon. They are weak against Ground-type attacks and Electric-type attacks don't affect to Ground-type Pokémon, so using a Ground-type Pokémon isn't a bad idea. Lt. Surge's Pokémon aren't anything special save for Raichu. It's fast and at somewhat high level. It also uses Double Team, which causes your attacks to miss more often. If you own a Geodude, use it to beat the gym. Lt. Surge's Pokémon do laughable damage thanks to Geodude's immunity to Electric, resist to Normal and high Defense stat. Use Magnitude to defeat them. Diglett is also very useful for beating the gym. It's fast and learns Magnitude too. Digletts can be found nearby in Diglett's Cave. It is highly recommended to use either of these two Pokémon. Lt. Surge will award you the Thunder Badge upon defeat. This badge will slightly increase the Speed of your Pokemon, and allow you to use Fly outside of battle. Lt. Surge will also award you TM34 Shock Wave, a decent Electric move that is unaffected by any Accuracy loss. There is a deck that leads to the S.S Anne ship, and you can get HM01 Cut there. However, you must have the S.S ticket in order to get on it (you can get it in Route 25 if you haven't gotten it yet). The dock may seem useless after the S.S Anne has sailed away, but it won't be. You will be able to get to the Sevii Islands from there, and if you get the special event tickets like the Aurora Ticket, you can use them in here as well. The Vs. Seeker can be found in Vermilion's Pokémon Center. It is highly recommended you pick it up, since it allows you to train your Pokémon by battling trainers you have fought before. Fighting Trainers usually results in greater XP rewards than fighting wild Pokemon. Moreover, trainer battles earn you money, whereas fighting a wild Pokémon does not. With the Old Rod you can finally start fishing. You can get the Old Rod from the house next to the Pokémon Center, just talk to the fisherman there. Old Rod mostly catches low level Magikarps. In the green roofed house above the gym there is a Pokemon Fan Club. Talk to the Chairman there and he will give you a Bike Voucher. You may take this item back to the Cerulean City bike store and the clerk will give you a Bicycle in exchange for the Bike Voucher. This trade can be found in the house with the orange roof, north of the Gym. Farfetch'd, a ninja duck that beats enemies with a giant leek, is a solid fighter, and capable of learning Cut. Because it was traded, this particular Farfetch'd goes up levels 50% faster than normal Pokémon. But since it doesn't evolve, it really won't get much better than it is right now, so using for the long term isn't recommended. This page was last edited on 17 October 2017, at 00:28. This page has been accessed 587,816 times.